"Best report that I receive. Comprehensive, easy to understand and extremely useful." Being a subscriber from outside the U.S. most of the information relating to specific stocks is of no use to me, but the comments on the broad U.S. market activity, gold, and the TA columns are very interesting and helpful when doing research and formulating an opinion on what's going on and what may occur. From someone who wouldn't get as much out of it as your 'home' subscibers, I still find it worth a read. A good read, guaranteed. Thanks and keep up the great work. Sadly, after 134 consecutive weeks of publishing, this is to be the final issue of Talking Points Premium Edition for the immediate future. Declining subscriber numbers have made it impossible to continue publication at this time. We hope to re-launch the newsletter at some point in the future, but that is not a certainty, and so we must for now cease publication. We appreciate all of our subscribers who have stayed with us over the last three years, and are sorry to have to say goodbye for now. We will notify all current subscribers if or when Talking Points is re-launched. In the meantime, we wish you the best in all your trades and hope that the information we have presented has better armed you in your market endeavors. For those of you who have your subscription payments managed by PayPal, simply log in to your PayPal account, click on the "Subscriptions" tab, and select to cancel your Talking Points subscription. If you signed up using 2CheckOut, please let us know and we will provide instruction on cancellation. Once again, thank you for the time you spent with us and we look forward to the possibility of seeing you again with a new and improved format in the future. Thanks again for subscribing to Talking Points Premium Edition! The Trader's Mindset: Do I Trade the Forecast or the Market? Click above for details on October's EXPO! Our new Week on Wall Street columnist is Bob Coppo. Bob is Managing Director and Chief Technical Analyst for JNL Financial Consultants, Inc. The company has operated StockmarketTimer.com on the internet since 1997 and provides investment advice to both individual and institutional clients. Make sure to visit his site, StockMarketTimer.com. Friday's Action: A sharp drop in oil prices helped the Dow turn around in late trading Friday, while the Nasdaq extended its gains on encouraging economic data. The US trade gap narrowed 9% in July, the sharpest decline since December 2001, and crude oil slipped below $43 a barrel. Major world markets posted mostly higher results on Friday. London's FTSE closed up 0.15%; Frankfurt's DAX finished higher by 0.90% and Paris' CAC 40 closed up 0.70%. Japan's Nikkei closed down 0.79%, Hong Kong's Hang Seng closed up 0.48%, and Sydney's All Ordinaries finished higher by 0.11%. In economic news, the PPI for August fell 0.1%, with the core rate also down 0.1%; the Trade Balance for July showed a deficit of $50.1 bil after a revised $55.2 bil gap in June. Volume came in at 1.26 billion shares traded on the NYSE and 1.61 billion shares traded on the Nasdaq. Market breadth was positive, with NYSE advancing issues over declining issues by 1.55, and up volume over down volume by 2.02; Nasdaq advancing issues over declining issues by 1.73, and up volume over down volume by 5.13. Leading sectors were Semiconductors, +3.40%, Airlines, +2.95% and Disk Drives, +2.63%. Laggards were Oil Services, -1.12% and Commodities, -1.06%. December became the front month for index futures on Friday. Dec Nasdaq 100 futures closed 22.50 pts higher to settle at 1418, while the Dec S&P's settled up 5.80 pts at 1123.90. Weekly Recap: Stocks notched their fifth consecutive weekly gain in a holiday shortened trading week, led higher by the technology sector, and specifically, the beaten-down semiconductor stocks. The SOX rallied on a round of cautious-sounding quarterly guidance from the likes of Texas Instruments and National Semiconductor. Chip stocks in particular, and tech stocks in general were in demand, as evidenced by the nearly 3.0% weekly gain in the Nasdaq. Cell phone maker Nokia also played a part with an upward revision to its Q3 sales and EPS outlook. Easing energy prices, Fed Chairman Greenspan's statement before the House Budget Committee that the economy is "gaining traction", an inflation friendly PPI report, and a drop in long-term interest rates all helped to keep selling in check and contributed to the bullish bias. Oil prices plummeted late Friday amid reports that speculators were unwinding positions. OPEC is scheduled to meet next week in Vienna to discuss output and prices. The Dow Jones Transportation Average, which is often seen as a leading economic indicator, broke out to a new 52-wk high, helped no doubt by the drop in the oil price. For the week, the Dow gained +0.5%, the S&P 500 finished +0.9% higher, and the Nasdaq rose +2.7%. The small cap Russell 2000 was up +2.5%. Next week, volume should start picking back up as traders return full time. The economic calendar has a full slate and Friday is quadruple witching expiration for options, futures and options on futures. The Ominous Trade Deficit: One of the big headline stories Friday was the decline in the trade gap. The Commerce Department reported a decline of nearly 9 percent, the biggest monthly drop in 2-1/2 years. Analysts had expected the deficit to narrow, but not so sharply. Thus, it was hailed as a sign that "things are getting better". But a look at the chart below shows that it has been such an ugly number for years now that a one-month bump almost doesn't seem to matter. The current trade gap still ranks as the second highest on record and is on track to become the worst year ever. The Current Account numbers for Q2 will be released next week and will almost certainly show no real improvement. The real question is how much longer can we expect foreigners to support our lavish, debt laden economy. Update on the POI Strategy: With September options expiring officially on Saturday, Sep 18th, an update on the Peak Open Interest (POI) strategy is in order. The POI is simply a chart showing the strike price where the maximum OEX call and put option open interest resides in the last week before expiration. The current POI resides at the OEX 540 strike. With just 6 days to go until expiration, the probability that the POI will change is diminishing. Defining the range where the OEX will close at expiration. Limiting "market exposure" to one week or less per month. Consistently returning 15% to 25% on investment per month. Controlling downside risk by the use of "market if touched" stop orders. If you would like to receive timely updates on this strategy, just send an email to info@peakinvesting.com and ask to be put on our distribution list. There is no cost or obligation. The COT Report: The latest Commitments of Traders report from the CFTC shows that Commercial Hedgers sold some 250 S&P 500 futures contracts last week to bring their net short position to -10,390 contracts. Large Traders remained net short -16,525 contracts, with the entire offsetting net long position of +26,915 contracts held by Small Traders, the so-called "weak hands". For the Nasdaq 100 futures, Commercials bought some 2,900 contracts to bring their net long position to +7,635 contracts. Small Traders were net long +4,256 contracts in the Nasdaq. Commercial action in Dow futures saw the smart money buy some 60 contracts to bring their long position to +4,627 contracts. Both Commercial Hedgers and Small Traders were better sellers in the S&P's last week. For the short term, their action is seen as neutral, but for the intermediate term, their opposing net positions should still be considered a bearish sign. Sentiment Surveys: The latest Investors Intelligence survey showed that the percentage of bullish newsletter writers came in at 45.9%, while the percentage of bears registered 26.5%. The bullish ratio (bulls/bulls +bears) remains high at 63.4%. The latest AAII survey showed an increase to 51% bulls, and a decrease to 24% bears. The bullish ratio came in at 68%, while the 4-week moving registered 60%. One thing to note about the AAII survey is that, while membership in this organization is quite large as investor groups go, the number of members that actually participate in the survey is very small. Thus, large fluctuations in survey results from week to week are not uncommon. The latest Market Vane survey came in at 63%, indicating that the majority of commodity trading advisors (CTA's) remain bullish on the future direction of the S&P's. The Short Term Outlook; 1-5 Days: Friday's price action favors making higher highs on Monday. There were a couple of short-term bearish signs on Friday. The NYSE TICK hit a high of +1264. Readings over +1200 coming at a weekly high often mark an interim top. The Nasdaq TRIN also registered an extreme reading of 0.34. Readings in the 0.3-0.4 range are frequently a sign that buying pressure is being exhausted. The Semi's have been the strongest sector over the last two days, gaining close to 9%. While the run-up was impressive, those kinds of back-to-back gains are usually unsustainable. The chart below shows that the SOX is approaching short-term overbought levels and is likely to experience a pullback soon. And since the SOX led the Nasdaq higher, it will most likely lead it lower. Our Stock Picks scan continues to languish, with virtually no new buy signals for the last three days. That's often a sign that the market is topping out. Also potentially negative was the action of the VXN and QQV, which dropped 5.3% and 8.7% respectively and fired one-day sell signals. While the VXN failed to close below its lower bollinger band, nonetheless, it's in deep oversold territory, and that's potentially bearish for the stock market. We suspect the market will top out early next week and then head lower. SMT's Pivot Point Forecast; 1-2 Weeks: Our Pivot Point RS indicator generated a BUY signal on Sep 8th. Our next Pivot Point is forecast to occur on or near Sep 22th. The 60-mn NDX chart below shows that the StochRSI indicator is in the SELL zone. For Monday, resistance for the S&P's comes in at 1127 and then 1133. Support lies at 1117 and then 1109. For the Naz, resistance comes in at 1427 and then 1436. Support lies at 1400 and then 1380. The Intermediate Term Outlook; 2-6 Weeks: The 70-day exponential moving average of the NDX:Dow Risk Aversion Ratio has been a good predictor of the intermediate stock market trend for the past two years now. The EMA turned down at the end of January as the Nasdaq made its high for the year. It then went flat for a period of months, confirming the tight trading range we've experienced for most of this year. The EMA turned down again at the end of June, suggesting there was more downside ahead. That scenario would fit with the historical market weakness often seen going into the Sep-Oct time frame. Last week's shorting of the Q's turned into a 2.5% loss for the Fresh Picks as the Nasdaq turned higher at the end of the week, looking surprisingly strong into the weekend. Have you traded any of our recommended plays along the way? We'd love to hear from you and how you did. Please send your stories to comments@talkingpoints.com. Jeff Neal is a veteran options strategist and trader with over a decade of experience in the trading business. Jeff has had a diversified business career operating a very successful management consulting business with his clients representing some of the largest companies in the world. He has a B.S. in Computer Science from Indiana University and an MBA in Finance from the University of Indianapolis. Jeff is a writer, mentor, and options strategist for Optionetics (http://www.optionetics.com/) and as head of his own hedge fund is an active options trader in both the equity and futures markets. The trend among small-business people in America is to go it alone versus hiring a large staff to conduct operations. A recent survey revealed that more than 83 percent of self-employed Americans do not have employees. There are several reasons for this new shift but technology appears to be the number one driving force. With technological devices such as cellphones, personal computers, fax machines and of course the Internet, entrepreneurs can run their businesses out of their homes and be quite productive without the need of additional employees. Where in the past many professionals who have gone solo would have needed at least an office assistant, the new technology eliminates this need. In fact, productivity experts assert that today, thanks to technology, one person can be just as productive as four people 20 years ago. Technology has contributed a great deal to the small-business person to be able to go it alone. Whether it is email, website presence, faxes, voice mail, word processing or any other hi-tech application, the capabilities are at every entrepreneur’s fingertips just waiting to be implemented. In addition to technology, other factors allow small business people to remain solo, such as the use of temporary help. Many sole proprietors contract temp agencies to meet any human resources needs. This gives them the ability to only add staff when they actually do need the extra help, which lets them keep their costs down. Oftentimes a small-business person will have a network of other self-employed personnel to draw upon to address any their labor requirements. Not having to provide benefits is another key reason entrepreneur’s prefer to use temporary help. This is because health costs for employees is staggering and for many cost prohibitive. According to a study performed by the Kaiser Family Foundation, costs for companies with three to nine workers rose 16.6 percent versus 13.9 percent overall last year. The average health benefits for just one employee are now over $600 per month. These excessive health insurance premiums make it very difficult to take on new permanent workers. Some economists assert that it is has been the weak employment picture that has led to the large surge in the self-employed that are going solo. They also indicate many of these newly self-employed people have virtually no start-up skills that require them to go it alone since their businesses never achieve enough profit that would afford them the opportunity to expand with additional employees. But even with the lack of business experience, the use of temporary help and the excessive costs of health benefits, the number one reason for this large increase in entrepreneurs going solo is technology. As it continues to evolve and get more prevalent, look for the overall productivity in our economy continue to benefit. This is why you will see even more self-employed people going solo in the coming years. Dale Woodson is the editor of Woodson Wave Report, a market-timing newsletter. Woodson Wave Report identifies turning point targets in the Dow, NASDAQ, and S&P 500 index as well as the bond and gold markets using Elliott Wave analysis and fibonacci ratios. Since publishing the newsletter began online in 1998, Woodson Wave Report has been downloaded in twenty-five different countries. We encourage our subscribers to visit his site at http://www.woodsonwave.com and please see Dale's complete bio following his column. #9 STOCK MARKET TIMER: 6/18/03  6/18/04. #5 GOLD MARKET TIMER: 6/18/03  6/18/04. #9 LONG TERM STOCK MARKET TIMER FOR THE YEAR 2003. #4 GOLD MARKET TIMER FOR THE YEAR 2003. #8 STOCK MARKET TIMER FOR THE FIVE-YEAR PERIOD OF 12/31/98- 12/31/03. #6 STOCK MARKET TIMER FOR THREE-YEAR PERIOD OF 12/29/00- 12/31/03. #4 STOCK MARKET TIMER FOR THREE-YEAR PERIOD OF 12/31/99- 12/31/02. #5 STOCK MARKET TIMER FOR THREE-YEAR PERIOD OF 12/31/98- 12/31/01. #4 STOCK MARKET TIMER FOR THE YEAR 2001. #7 STOCK MARKET TIMER FOR THE YEAR 2000. #5 BOND MARKET TIMER FOR THREE-YEAR PERIOD OF 12/31/99- 12/31/02. it should terminate about the year 2012"
* "...not expected to terminate until about 2012"
Primary degree wave 2 down (1987 - 1990) running flat correction. The stock market has made what appears to be a strong comeback from the August lows below 9800. It’s been a nice gain, yes. But don’t be fooled. Since our fibonacci turning point high in February, the market has attempted this same rally twice before. 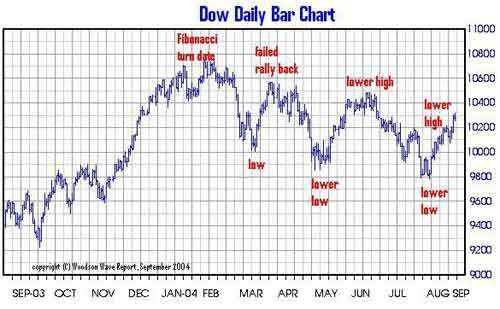 Each failed rally back attempt is met by the same fate  a decline to lower lows. Check out the chart above. This chart is eerily similar to the price action from the January 2000 highs. In that case, the market made no less than six rally back attempts. Each move up was followed by yet a bigger move to the downside. Today, the Dow is on attempt number three. We weren’t fooled in 2000 and we’re certainly not falling for it four years later. The chart above is a perfect definition of a bear market. Lower lows followed by failed rally backs to lower highs. Repeat the cycle. We might expect the current rise to terminate soon as strong resistance lies just ahead near the 10,500 mark. Any move higher from current levels should stop below that area of stiff resistance. In the bigger picture, critical resistance remains at the February high of 10,746. It would take a move above this high (not expected) to cause us to rethink our larger wave count. 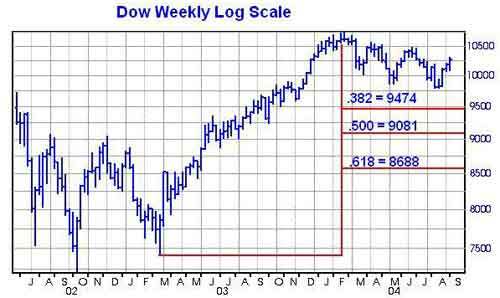 The Dow advanced some 3330 points from the March 2003 lows into our fibonacci turning point date. At a bare minimum, this market needs to correct at least that gain. The smallest correction would be a fibonacci .382 retracement. With even the smallest of corrections, we should see a decline to below 9500. And that’s just the bare minimum. Once that target is achieved, more bearish potential lies ahead. A .500-fibonacci retracement points to a decline to 9081, while a .618-fibonacci retracement gives us a target of 8688 for the Dow. Ultimately, the Dow should break below the 6,000 level before the bear market is complete. In the near term, the most recent advance is complete or nearly so. Resistance near 10,500 should trigger a reversal of the most recent rise to the downside. The count in the S&P 500 is the same. The fibonacci target prices in the S&P are 1020, 976, and 932. The price targets for the NASDAQ are 1809 (already achieved), 1703 and 1597. 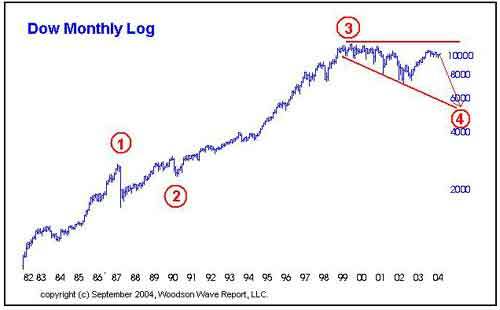 Back in 1999, we anticipated primary wave four in the market. We even stuck our necks out calling for a triangle pattern for this fourth wave correction. We have also been consistent with the analogy that the crash in 1987 and subsequent price action in the market to the 1990 lows represented a second wave (expanded flat in the Dow). Wave B of the second wave correction (1987- 1990) in the Dow extends much higher than wave B in the NASDAQ. The chart above illustrates the bigger wave count much more clearly through the eyes of the NASDAQ composite index. 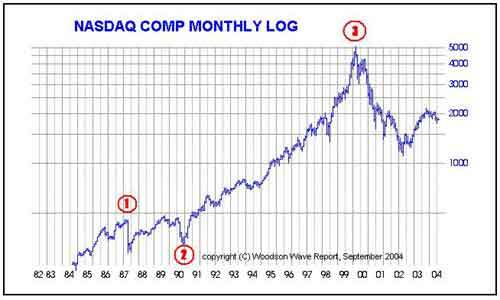 Yes, the NASDAQ is in a fourth wave of primary degree, just like the Dow. Unlike the Dow, this fourth wave has already corrected some 78% (at its low) of the preceding third wave advance. As the Dow chart below illustrates, this fourth wave is still missing one more plunge to the downside. That last leg down to below 6,000 is all that is needed to complete this primary bear market. If it were to bottom this year, it would mark a perfect fibonacci five yearlong bear market. Obviously, the price action of the next several months will have the most significant impact on the direction of the market for the next three years. Either the bear market ends now (this year), or more than likely it extends to the year 2007. The main point here is that this is a fourth wave - and fourth wave corrections are always followed by the same thing  a fifth wave advance. That fifth wave to new all time highs will either begin later this year, or we will have to endure three more years of the bear market first. Either way, the fifth wave up will follow. Hang in there. The bond market has challenged our wave count once again. At first, it appeared to reverse course at the perfect .382 fibonacci retracement level. Then it moved higher only to once again stop right near our .618 fibonacci retracement mark. Now, the market is threatening our make or break point. The second wave correction (see chart page 2, July 12, 2004 issue) topped in March of this year. The ensuing decline into the June lows represents the beginning of wave three down. The rise up from those lows must hold below the wave two high, in this case 114-30 basis the September contract. That is our make or break point. Any move above this level, negates the larger wave count (July 12, 2004 issue) and signals higher prices ahead. Therefore, we will remain short against the 144-30 high. Any move above this level moves us to a long position. Like bonds, gold is challenging our wave count. We expect wave c down to near $362. The recent rise above $410 indicates that wave b up is still in force (see chart page 1, July 12, 2004 issue). The make or break point in our gold count is the April high of $432 basis the October contract. Any move above this level signals higher prices ahead and moves us to a long position. In the meantime, we remain short against that $432 high in anticipation of wave c down to near $362. in inferring that any trading advice is given. Woodson Wave Report, LLC does not offer specific trading recommendations. Long-term counts are found on weekly and/or monthly charts and generally cover a time period of years to decades. Intermediate-term counts are found on daily and/or weekly charts and generally cover a time period of weeks to years. Short-term counts are found on daily and/or hourly charts and generally cover a time period of days to hours. Long term: Remain short expecting wave (E) down to new lows. Short term: Remain short, as the anticipated short-term bounce appears complete. 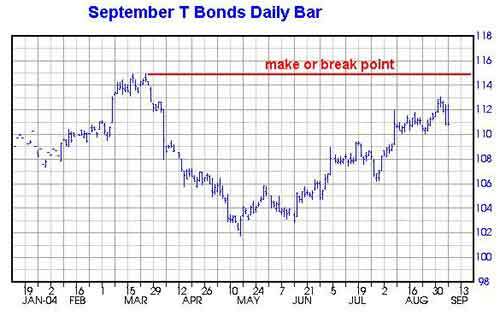 Bonds: Remain short against the 114-30 high basis the September contract. Move to a long position with any move above this mark. Gold: Remain short against the $432 high. Move to a long position with any move above $432. Dale Woodson is editor of Woodson Wave Report, a market-timing newsletter. Woodson Wave Report identifies turning point targets in the Dow, NASDAQ, and S&P 500 index as well as the bond and gold markets using Elliott Wave analysis and fibonacci ratios. Since publishing the newsletter began online in 1998, Woodson Wave Report has been downloaded in twenty-five different countries. While there is no feeling like catching a turn on the dime, Dale especially enjoys writing the newsletter. He is most proud of the numerous correspondences complimenting him on his writing abilities. He has a real passion for his work. He knows that the market will move in certain Elliott wave patterns and fibonacci sequences. His challenge is to identify those patterns and sequences in advance, while there is still time to profit from them. Woodson Wave Report offers monthly, quarterly and yearly subscriptions. Newsletters are delivered via email and URL links and are published on the first Friday of every month. Special interim reports are released as market conditions warrant and targets are achieved. All new annual subscribers receive two months free. Disclaimer: The Woodson Wave Report combines Elliott Wave analysis and Fibonacci ratios to identify turning point targets in the Dow, NASDAQ, S&P 500 cash, bond and gold markets with respect to both price and time. The monthly newsletter is generally released on the first Friday of the month and special interim reports are issued as market conditions warrant and as targets are achieved. The information contained in the report is prepared solely for informational purposes and should not be taken as an offer to buy or sell any investment vehicle. Past performance is no guarantee of future results. Woodson Wave Report is waived of any liabilities. The jury is still out on gold. Will the verdict be bull or bear? It’s too early to tell but I am leaning toward the bullish side. Gold traded in a narrow range during the holiday shortened week. The yellow metal opened after Labor Day at $403.80, fell to a low of $396.90, and then spurted upward to a high of $404.90 before closing the week at $403.80. Gold now sits above the trend line from the low made last May and is also above both the 50 day and 200 day moving averages. All of this is positive but gold has yet to make a definitive move. Resistance is between $413 and $416 with support between $396 and $400. The fate of gold depends in large measure on the dollar. The greenback had an up and down week after opening on Tuesday at 89.41. The dollar gained strength on Wednesday morning (rising to a high of 89.73) but then sunk to support (at the 50 and 200 day moving averages near 88.67) by Wednesday afternoon. The dollar fell completely out of bed on Friday, crashing to a close at 88.39. If the greenback recovers (to at least above 89.50) then the gold bull may be stymied once again. However, if the dollar keeps sinking, it will be music to the bull’s ear and gold should easily bound above $416. Gold stocks, as measured by the XAU, continued to be boring. The XAU opened at 91.67, fell below the top of the trading range (92) for a brief period but is now consolidating between 92 and 93. The XAU has to close above 95 to keep the bull happy and healthy. For the last several weeks we have been discussing Newmont (NEM) and have presented some potential high reward to risk trades based on playing the gap between $42.39 and $42.69. The strategy was to buy NEM as it neared the top of the gap ($42.69) with a stop slightly below the gap bottom ($42.39). Last week presented two more opportunities to play this strategy. NEM fell to $42.60 on Tuesday and to $42.50 on Wednesday. Both times, NEM could not close the gap and bounced upward, closing the week $43.30. Where do we go from here? In my opinion, the gold bull is just resting and the upward march will begin again soon. Only an extended drop below $400 would cause me to move to the sidelines. But as I always warn, you should never rely solely on my (or anyone else’s) opinion. Gold is risky and only you can decide if it is the right investment for you. You should do your own due diligence and evaluate your risk tolerance before making decisions to buy (or sell) any stocks or funds. Best of luck! Talking Points member - Over the nearly two years that we have carried the Mr. Swing's Place column, Larry's picks have consistently put in great performances. Don't miss out on the full swing-trading content available at Mr. Swing.com. Take advantage of some of the great programs available by clicking here. REVIVAL (Track1) + REVERSE (Track2) + TRIANGLE (Track3) are different scans developed by MrSwing. Gladstone Capital Corporation (GLAD) invests in debt. The company is a closed-end management investment company. It owns Gladstone Advisers Inc and Gladstone Business Loan LLC. Gladstone Capital missed several quarters of earnings estimates. During this period, the stock declined from a high of 23.71 to a low of 18.91. With a recent earnings beat, the stock rebounded from the lows, and is currently consolidating at levels near the prior high. We note, however, that the fundamental picture has been significantly bettered since the last high; thus, we believe that the stock should be more highly valued. This view is supported by our analysis of valuations. Gladstone Capital has grown revenues over the prior years revenues every quarter since it went public. Earnings results during the companys fiscal year 2003 were rocky; however, the fundamentals appear to have recovered. A director of the company purchased 1,000 shares at an average price of 22.20 on March 17th of 2004. Insider buying is generally a good signal. Analysts currently forecast 2004 EPS of 1.38, and 2005 EPS of 1.61. These forecasts are up from the estimates of 1.26 and 1.51 which prevailed thirty days ago. Consensus estimates also call for 5-year EPS growth of 17%. 2 analysts rate the stock as a strong buy, and 3 as a hold. Both analyst ratings of stocks and changes in analyst estimates have been found to be predictive of future stock price appreciation. The above information is thus bullish. GLAD has P/EG ratio of .94; this is significantly lower than the industry average of 1.42, and slightly lower than the valuations held by close competitors (ACAS, for example, has a P/EG ratio of 1.10). GLAD trades with a forward P/E ratio of 14.5, and a forward P/EG ratio of .85. Noting that the company has a 6% dividend, and this will hurt growth, the forward P/EG ratio is very low. Based on our generic and comparative analysis of valuations, we believe that the share price is significantly below reasonable levels. The recent advance towards resistance has been followed by a phase of consolidation within a small range. Volume increased during the advance, and has since petered off. This combination of events constitutes a bull flag pattern, and is a positive sign. Mr.Swing DISCLAIMER: Information for the stock observations was obtained from sources believed to be reliable, but we do not warrant its completeness or accuracy, or warrant any results from the use of the information. Your use of the stock observations is entirely at your own risk and it is your sole responsibility to evaluate the accuracy, completeness and usefulness of the information. You must assess the risk of any trade with your broker and make your own independent decisions regarding any securities mentioned herein. Affiliates of MRSWING.com may have a position or effect transactions in the securities described herein (or options thereon) and/or otherwise employ trading strategies that may be consistent or inconsistent with the strategies described above. © Copyright 2002, MrSwing.com. All rights reserved. COPYING AND OR ELECTRONIC TRANSMISSION OF THIS DOCUMENT WITHOUT THE WRITTEN CONSENT OF MRSWING.COM IS A VIOLATION OF THE COPYRIGHT LAW. Considered an expert in technical analysis and complex computer trading platforms and applications, Bennett has educated and helped traders worldwide improve their trading. Bennett is well known for helping traders overcome sabotaging psychological issues that keep them from reaching their full potential. In addition to his educational and coaching abilities, Bennett, a registered securities broker, manages money and trades for clients throughout the United States. Bennett released his home study course Applied Reality Trading, also known as "ART" in January 2002. His cutting-edge course teaches traders his state of the art Pyramid Trading Points, Money management, and developing the "Trader's Mindset." Bennett is also known for developing The Trader's Assistant - a premier trade-posting record-keeping system for traders, as well as writing and publishing The Survival Guide For Traders, a book on how to set up and organize your trading business. Bennett provides private consultation/coaching services to many traders throughout the world by telephone, video conferencing, and in person. Working with Bennett, traders spend time focusing on trading system development, trading psychology, and disciplined money management. DO I TRADE THE FORECAST OR THE MARKET? A number of my clients have asked this question and others have wondered what it means, so I want to talk about it. Many trading systems and just about all opinions of market direction aim at forecasting the market. Whether the trader uses fundamental or technical analysis, if an opinion is being generated, the trader is attempting to forecast the market. Some use Elliott Wave theory, some rely on P/E ratios but the overall purpose is to estimate where prices will be at some point in the future. These types of analysis can at times be pretty accurate, but not always. As traders and human beings we will always have opinions and ideas based on our beliefs about what we have experienced. No matter how hard we try not to have opinions, we just can't seem to help having them. As traders it is how we use these opinions, forecasts, and beliefs that is important. As far as the markets are concerned, the first and foremost thing to realize is that all these opinions or forecasts about the markets are nothing more than fantasies since at the moment their reality does not exist. With this said, do we want to just trade fantasies? Obviously not! But how can we use these forecasts to help us in trading instead of hurting us? These are important questions. Let me give some examples and analogies of how forecasts can help or hurt us. Let's say you believe the forecast based on Elliott Wave theory indicating that stock XYZ is about to begin a trend up. Even the MACD is indicating positive divergence. You say to yourself, a no brainier, I'll buy here and wait. Another week goes bye and instead of beginning it's up-trend, XYZ stock goes lower. You say to yourself that you entered this trade to early, but that you BELIEVE that it will head up very soon, so you hold on another week. Next week the stock goes lower and now you are now worried. The MACD bullish divergence is still present and the Elliott Wave forecast remains the same, but it looks like it is heading down for one last time, a shake out you say. You think to yourself, “Can't go much lower,” so you hold on. The next day the stock plummets, you panic and sell out your position and scratch your head saying how could that happen? It happens all the time to traders that trade the forecast and not the actual market!!! In this example, the trader held on to his fantasy based on his forecast. His faith in his forecast lead him not to use a stop-loss, which is typical for traders locked into this type of forecast trading. After all, their ego is involved here too. Let's take the same example and show how to use the forecast to our advantage. Instead of just buying the stock outright based on it's positive forecast, we wait until the stock shows sighs of actually reversing it's trend down. We feel based on our forecast that this stock will turn around soon but the current reality indicates that it is not happen now. So by not buying the stock and instead waiting for the price of the stock to shows signs of actual strength, we as traders are "Trading The Market And Not The Forecast." However, we are using the forecast to get ready and to keep this stock in our lists of possibilities. I want you as traders to look at forecasts to help round out your trading. It is another tool in your bag of tricks so to speak. Use this analogy as a way to think of forecasts. Let's say you are planning a sailing trip for the day. You check the weather forecast and it is not good with heavy rain and wind expected. You have a great boat, you’re an experienced sailor, so off you go. As you leave the dock, the weather is perfect. It is sunny with light winds. Now I ask you, even though the forecast is for very heavy rain and heavy winds, would you wear your rain gear now or wait until conditions change? I would wait until conditions actually change. You would also set the sails of the boat to the current weather conditions and winds and not the forecasted conditions which may or may not even happen. If you put up small storm sails now you will not be able to sail the boat in the current light air conditions. As weather conditions change, you change along with the weather! The sailor in this example would use the forecast to be PREPARED for a possibility of bad weather by bringing rain gear and the proper sails and crew. It is the same with trading! Whatever the forecast is, take note but trade with the current conditions and be ready if conditions change. In other words, "Trade the Market, Not the Forecast!" Or maybe another way of looking at it is to "Live In The Present And Not The Future Or The Past! Free Video  Trading The Perfect Business! Copyrighted © 2003 TradersCoach.com, Inc. All rights reserved. As a leading contrary investing expert, Jeff has written own investing book, I Guarantee You Will Buy Low Sell High and Make Money, which shows you when to buy and sell the stocks he recommends in his book. You can order the book by clicking on the title and it comes with a free one-year subscription to his newsletter, one month of coaching articles, and one year free email support. Looks like, smells like and tastes like advisors  but do you want to step in it??? and doesnt even want the little investor to get the crumbs. Here is how the brokers do it to you with the help of the SEC. Im going to use Merrill Lynch as the broker punching bag this month but realize all of the other brokers have gyms also with punching bags I could be punching. Lets go to the Merrill Lynch web page and we see a cornucopia of financial advice implying Merrill is only interested in helping you and not themselves. So you are feeling good and lightheaded in this rarified air. Merrills site is not displayed as crass commercialism  but rather as philanthropy that's sole purpose is to offer: a relationship that provides you with a lifetime of solutions. What a great glittering generality! 'Cause you see, Merrill Lynch looks like a financial planner, smells like a financial planner, and tastes like a financial planners but IS NOT a financial planner. Heres the difference. Real financial planners have higher standards designed to protect you, the small investor. Of course not all planners follow that standard but you can sue them for failure to follow that standard. Brokers have to recommend investments that are suitable for your financial goals. But financial advisors have a fiduciary duty to put you ahead of their companies interest. Cant open the dusty closet and sell you that old stock thats been lying in there for years! Also cant sell your stocks without prior consent. All brokers have to do is notify you after they sold your stock  you had nothing to do with the sale. For many, many years there was a clear distinction between broker and financial advisors. Brokers worked for commissions buying and selling investments, while advisors worked for fees like a certain % of the money managed. But you not friend to small investors, the SEC, changed the rule in 1999. The SEC proposed a rule that was never formally adopted that allowed brokers more leeway to sell advice for a fee without meeting the advisor standards. Think lobbyists helped the SEC reach that unfriendly stab in the backs of small investors? The big brokers lobbied for the change because they were between a rock and a hard place concerning there big worry  big profits. The discount brokers hit them one way and financial planners hit them the other way. Since the big brokers were losing commissions, they wanted to shift and get more fee-based income. So ala SEC loophole  brokers could offer advice for a fee without being subject to the higher ethics of advisors IF the advice was solely incidental to brokerage services and if the customer had ultimate authority over the account  loophole big enough to drive tractor-trailers through!!! Believe this or not  the SECs logic was that this would help investors  thats highly debatable  but theres no debate it helped big brokers! This is funny. Did you know Merrill Lynch now has NO BROKERS  all of their 14,000 brokers are called financial advisors. And about a 1,000 of these advisors are certified financial planners Merrill has e3arned over $237 billion in fee-based accounts. Merrill says there clients are protected by lots of federal and state rules (Baloney only the New York Attorney General and few others are protecting investors. Good ol broker lawyers (who cant have any ethical codes whatsoever except protect the client) insist that the advice brokers give is limited to helping customers choose among financial products  ha! The truth lies in brokers advertising, which says advice IS the main product. Brokers want it both ways, have it both ways thanks again to that 98-lb. Weakling of investor protection  the SEC. I sure wish William O. Douglas could rise from his grave to run the SEC again  there was a man who protected investors!!!! Near 52-week low  Near low, earnings show growth in the future. Near low and shows strong earning increase estimates for the future. Jeff Williams is a partner with http://www.insiderreview.com For the past seven years Jeff has done extensive investment research as a member of an institutional investment team. His background consists of a degree in Finance from the University of South Florida with a minor in Economics. Jeff's everyday activities as an insider stock analyst consist of analyzing data available through a multiple of sources as it applies to all publicly traded companies. With this information he can then make short-term and long-term evaluations on a company’s present and future performance based on insider buying patterns. Each month Jeff will share with you his thoughts on stocks he believes to display the most interesting insider buying patterns. HRPT Properties Trust is a real estate investment trust (REIT) engaged in the ownership and operation of real estate, including office buildings and leased industrial land. During the year ended December 31, 2003, the Company had investments in 238 properties. Its portfolio includes 11 parcels with 9.8 million square feet of developed industrial lands in Oahu, Hawaii, which the Company acquired in December 2003 and 227 buildings with approximately 26 million square feet of space. HRPT also owns minority equity positions in two former subsidiary REITs, Senior Housing Properties Trust and Hospitality Properties Trust. In 2003, Senior Housing owned 150 senior housing properties and Hospitality Properties owned 286 hotels. Reit Management & Research LLC (RMR), its investment manager, conducts the day-to-day operations of HRPT. RMR also acts as the investment manager to Hospitality Properties and Senior Housing and has other business interests. Mr. Zeytoonjian has been a trustee since 1999. Mr. Zeytoonjian is the founder and has been Chairman and Chief Executive Officer of Turf Products Corporation, one of the largest distributors of lawn care equipment in the United States, for over five years. Mr. Zeytoonjian has been a trustee of SNH since October 2003. Mr. Zeytoonjian is a Group I trustee and will serve until our 2005 annual meeting of shareholders and until his successor is elected and qualifies. We like the fact that HRP has been in a strong up-trend in the past few months. This large purchase by Zeytoonjian into this price strength is very encouraging. The fact that he has been with the company since 1999 suggests that he should have a good understanding of business conditions. We suspect that this large purchase into the recent price strength is a good indication of continued strong business conditions. Based on this buying, we look for a strong earnings report and continued upward pressure on the stock price. Do you have comments, thoughts or opinions on Talking Points that you would like to share? Email them to letters@talking-points.com. Weekly Stock Picks From Bob Coppo - New Feature! We have no new buy signals for Monday. Bob Coppo is Managing Director and Chief Technical Analyst for JNL Financial Consultants, Inc. The company has operated StockmarketTimer.com on the internet since 1997 and provides investment advice to both individual and institutional clients. Make sure to visit his site, StockMarketTimer.com. and click on the "Past Issues" menu item. 7. We disclose any and all compensations received from companies profiled or mentioned on the site in accordance with the 1933 Securities Act Section 17 (b).